This coming week’s tarot wellness challenge is sticking with our goals all the way to completion. Read on for the details! 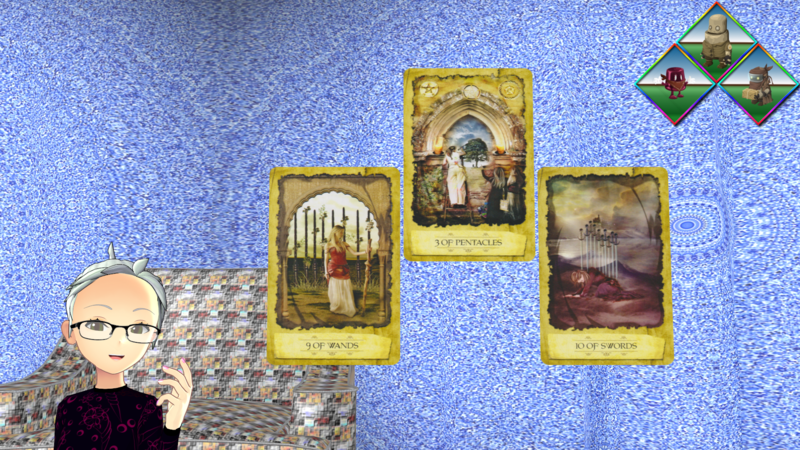 The purpose of this Chaos Rally tarot reading is to take a look at the coming week and see in what way we can challenge ourselves to do better in regards to our overall wellness. I ask you to approach this as a fun brainstorming session of possibilities rather than me prescribing a course of action to you. And again, in terms of wellness I want to point out that this applies to the physical, mental, emotional, and spiritual aspects of the self. All four of these comprise the total sense of being and need to be taken care of in order to be well. As always, and I cannot stress this enough, be sure to speak to the appropriate professional before making changes to your care plan. This is especially true if my reading for some reason inspires a change in diet, exercise, supplements, or medications, or even raises a concern regarding to your health. I’m not a specialist in any of these fields. My goal is to look at how to manage wellness in the presence and with the cooperation of your professional care team. Please keep this in mind when going over this reading. Here is the image of this coming week’s reading. The challenge this coming week is to remain faithful to your long-term goal and stick with the small steps required to achieve it. Monday Button’s position represents the challenge you need to be working on at this time. 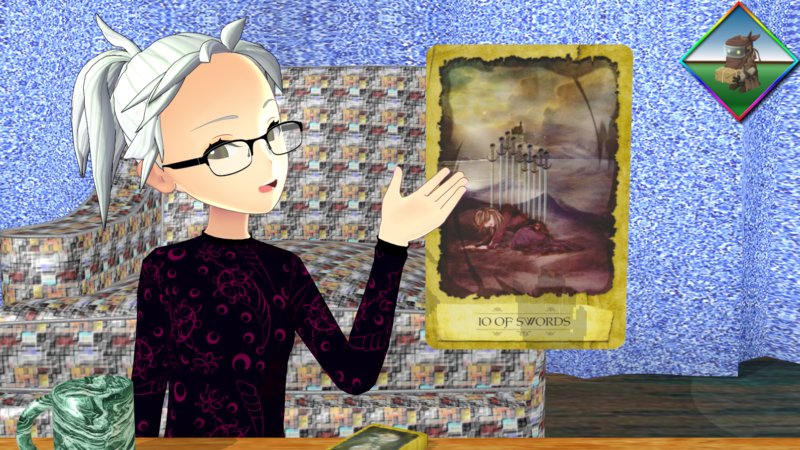 Thus, what you need to be working on right now is found within the Nine of Wands. This card is about undaunted determination. It’s about keeping on even when it might not look like you’re getting anywhere. Losing weight or becoming physically fit doesn’t happen overnight. It happens through dedicated consistency of small steps. This is true of any long-term goal. The lesson to be learned this coming week is focusing only on the task at hand. Grim Lee’s position represents what you need to be learning while working on your challenge. 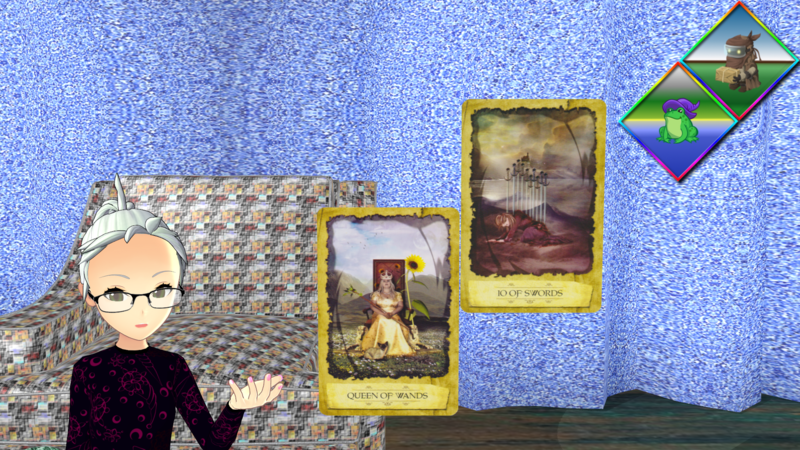 Therefore, your lesson at this time is found within the Three of Pentacles. This card’s primary message here is focus. Look at how all three people in the image are zeroed in on the project before them. So the lesson to be learned this coming week is just that, learning to focus only on the task at hand. It’s only through focusing on one step at a time that you’ll be able to reach your goal. It’s only through focusing on one step at a time that you’ll be able to reach your goal. What those steps will look like depends on the goal you are trying to achieve. For example, you can’t say, “I’m going to get myself in shape this year,” and then turn around to eat junk food and sit on the couch every day. Instead, you will need to commit yourself to a proper daily diet and weekly workout regimen of some kind. The inner lie to let go here is that the end will never come. It’s simply not true. Murphy Law’s position represents the false belief you need to overcome while working on your challenge. The inner lie at this time is revealed within the Ten of Swords. This card is about exhaustion and release. The inner lie to let go here is that the end will never come. It’s simply not true. As long as you keep putting one foot in front of the other, eventually you will reach the destination of your journey. This is the point where we see the difference between failure and success: when we decide to keep going or to give up. Whenever we have a long-term goal it’s easy to become exhausted and give into the false belief that we will never make it to completion. This is the point where we see the difference between failure and success: when we decide to keep going or to give up. Determination is everything here. Instead of giving into the lie that the end can’t be reached, focus on just the task at hand. Instead of giving into the lie that the end can’t be reached, focus on just the task at hand. Complete one step at a time. As long as you keep doing that with your goal, it won’t be long before you do in fact reach the end. By continuing to work on our goals by focusing on the individual steps one at a time we will the reach the end eventually. So looking at these three cards, we can see that by continuing to work on our goals by focusing on the individual steps one at a time we will the reach the end eventually. We need to embrace the fact that success doesn’t come over night, but rather through a series of many nights. The advice to keep in mind this coming week is to be willing to turn to those you know for help with your goal. Wise Toad’s position represents the wisdom to keep in mind as you work on your challenge. 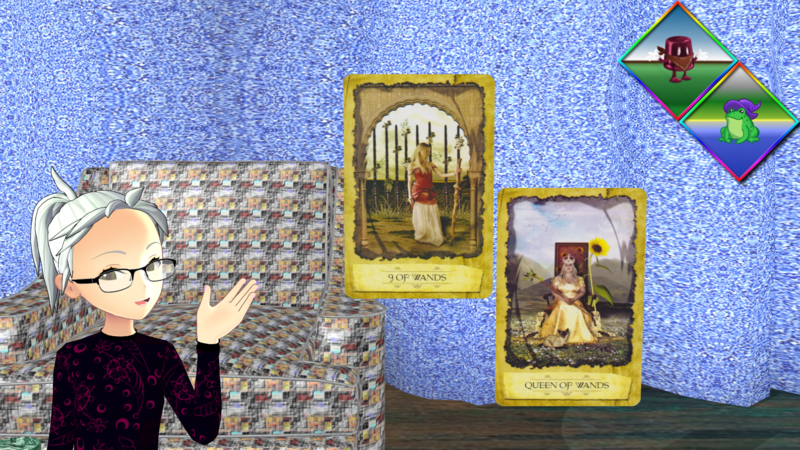 The wisdom you need at this time is found within the Queen of Wands. This cards represents the warm, vibrant persona of the social networker. The advice to keep in mind this coming week is to be willing to turn to those you know for help with your goal. When you are feeling overwhelmed with your goal, seek the advice of a mentor. When you are feeling overwhelmed with your goal, seek the advice of a mentor. Find someone who is where you want to be and has already gone through what you have been through. Discover what they did to get through what you are trying do now. Even if you don’t know someone personally, the internet has a wealth of information available at your fingertips. It’s merely up to you to search for someone you feel is credible and trustworthy. Get more hands involved whenever appropriate to ease the burden and to maintain your focus. 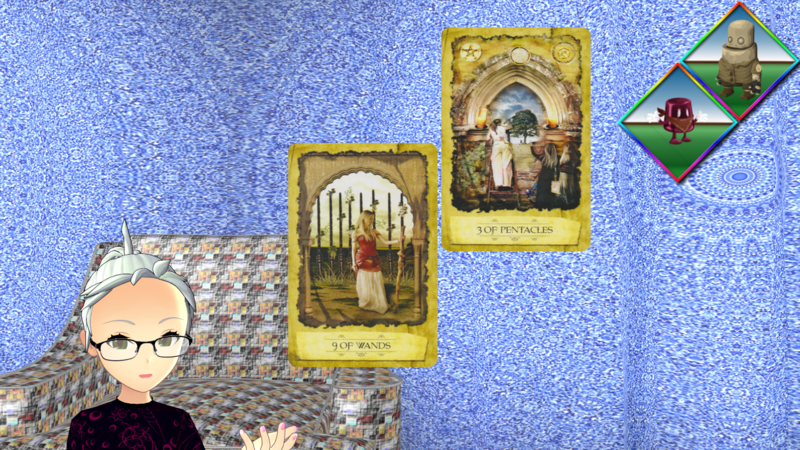 Notice how in the Three of Pentacles there is a group working together? The number three in tarot often indicates a need for a group effort while the suit it belongs to points to where that group’s energy needs to go. 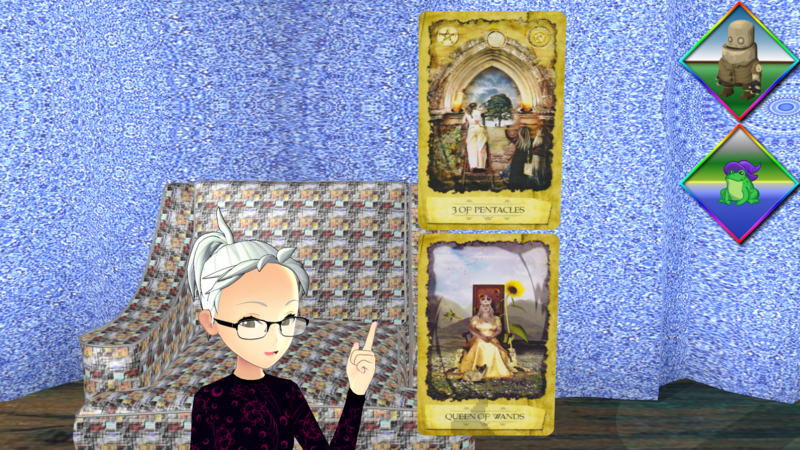 Here, in the lesson from the Three of Pentacles there is a call for focus while in the wisdom from the Queen of Wands there is a call for tapping into human resources. More can be accomplished in a group than alone. Get more hands involved whenever appropriate to ease the burden and to maintain your focus. Whenever you feel disheartened and about to give up, turn to those you deeply trust that support your goal to be uplifted and encouraged. Whenever you feel disheartened and about to give up, turn to those you deeply trust that support your goal to be uplifted and encouraged. We all have cheerleaders in our lives. Find yours and nurture them. With determination and focus we will achieve the completion of our goals so long as we remember that we always have people in our lives willing to help us along the way. Looking at the entire spread, we see that with determination and focus we will achieve the completion of our goals so long as we remember that we always have people in our lives willing to help us along the way. Here is the music playlist inspired by the overall theme presented in this reading. 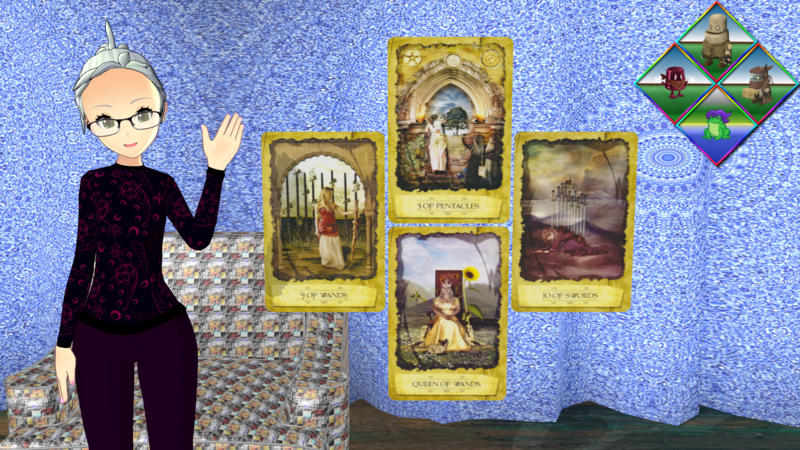 Thank you for taking the time to read this week’s Chaos Rally tarot reading. If you found it helpful to you, please let me know in the comments below. If you’d like a personalized Chaos Rally reading of your own, you can order one here at my Tode’s Tarot online store. ~ The images used for the Team Goblin characters were found on pixabay.com under the CC0 license. ~ Credit for 3D model and assets used in renders can be found here. 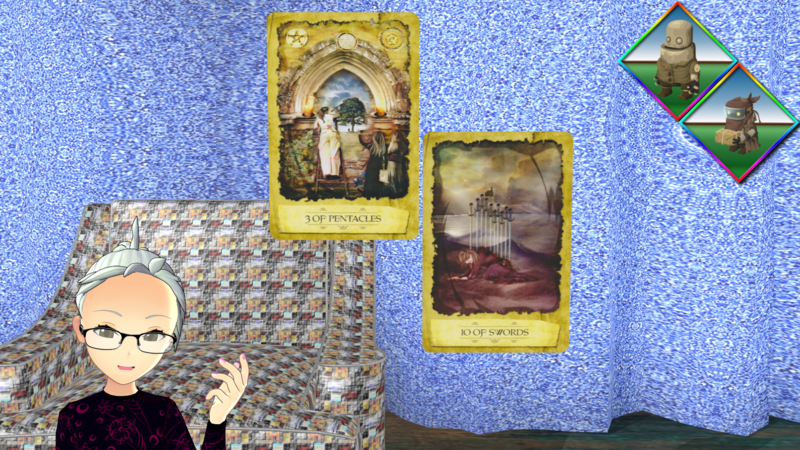 In certain jurisdictions, a tarot professional is required to disclose to you that tarot readings should be for entertainment purposes only, and if such a law applies to this reading, then you are hereby on notice thereof.